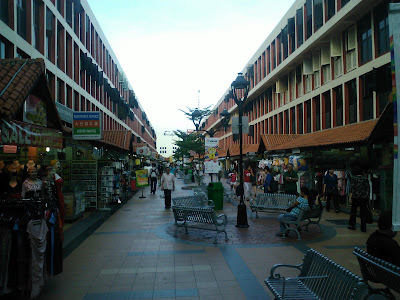 If you read my previous article, I talked about my trip to Ang Mo Kio Town Centre. 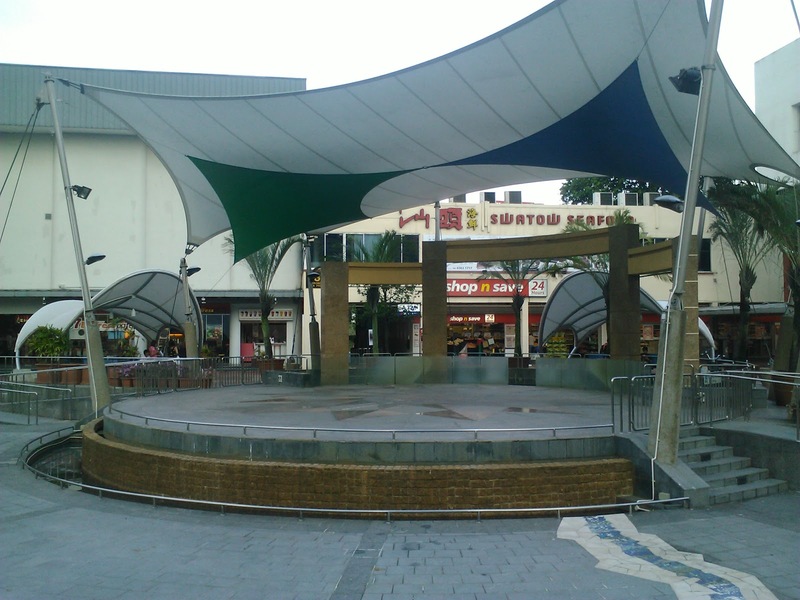 Ang Mo Kio Town Centre is located in the heart of the northern estate, Ang Mo Kio and has several facilities available at the town centre. These include Courts furniture store, Broadway Plaza, Ang Mo Kio Public Library, Ang Mo Kio Hawker Centre and so much more. I hope you enjoyed that article and I do hope that you have visited the town centre after reading about it on my blog. 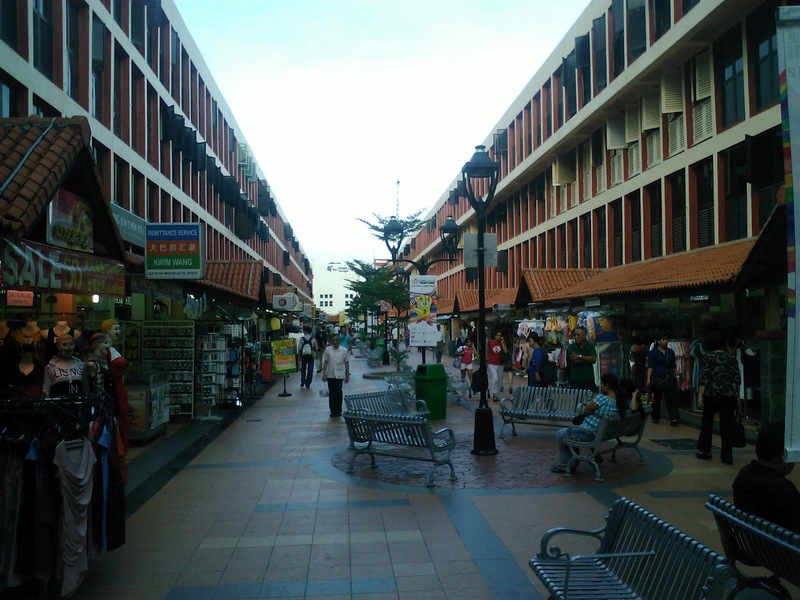 Next, I am going to give you a brief tour of another town centre that I also enjoy going which is Toa Payoh Town Centre. 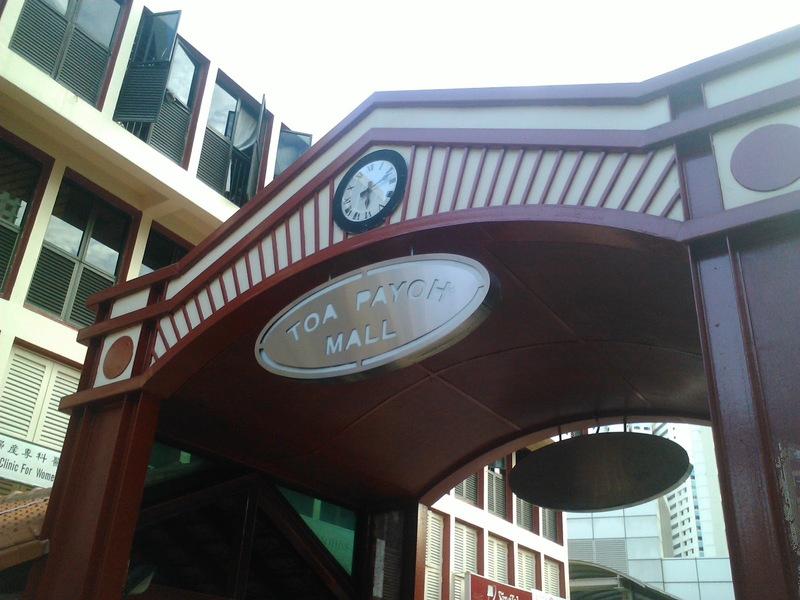 Toa Payoh Town Centre is located in Toa Payoh which is the first HDB satellite town in Singapore. 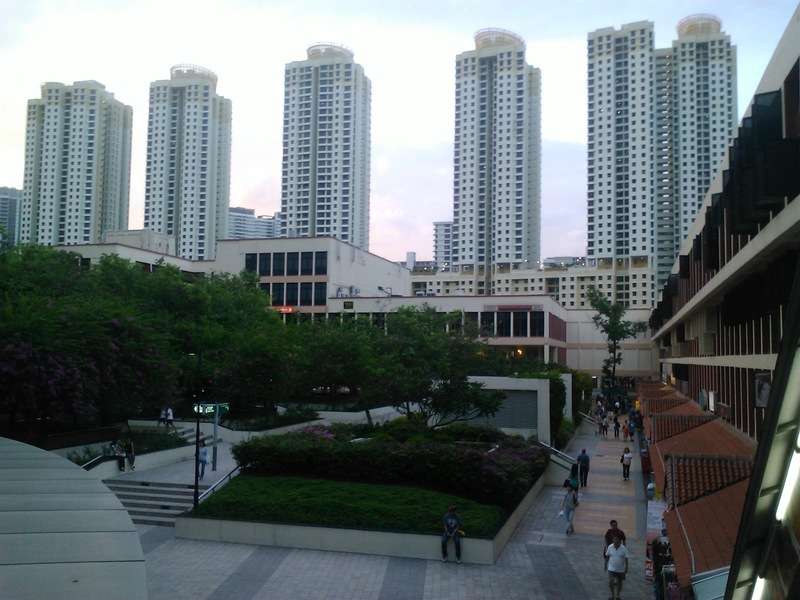 Toa Payoh has a mixture of old HDB flats and new HDB flats within a short distance. Toa Payoh also currently has HDB flats which are considered Singapore's tallest and it has a town centre, a shopping mall and an integrated public transport hub similar to the one found in Ang Mo Kio. If you don't know what a Town Centre is, do check out my previous town centre article right over here. Without further ado, let me show you around the town centre. 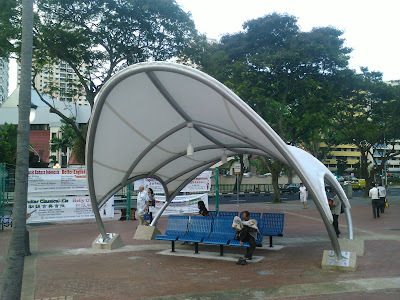 Usually, people get to Toa Payoh Town Centre with the help of Toa Payoh MRT Station and bus services that terminate at Toa Payoh Bus Interchange. For me, I reached Toa Payoh Town Centre by taking a straight bus from my house all the way to the bus stop along Toa Payoh Central. 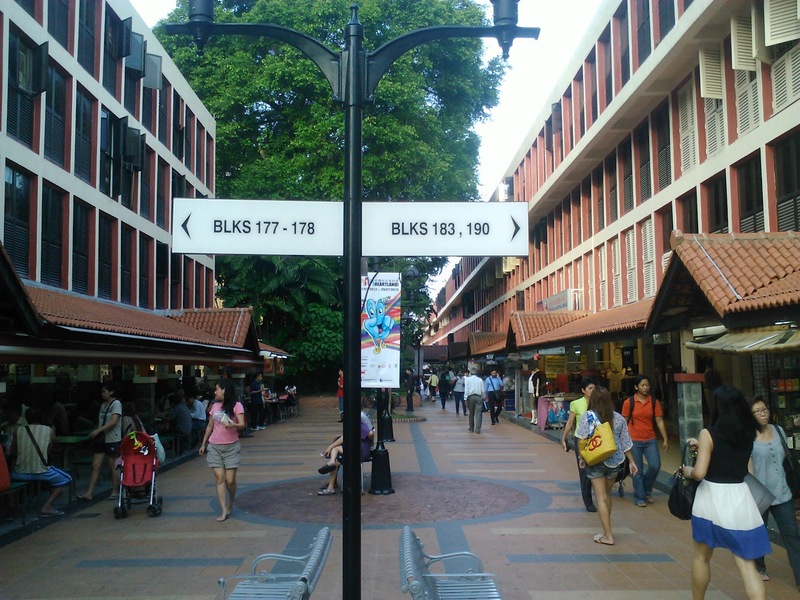 Once you alight from that bus stop, you have successfully reached Toa Payoh Town Centre. 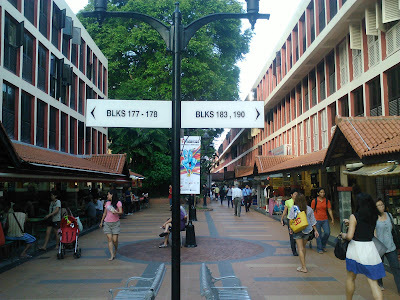 As you can see, just like other town centres, shops and restaurants are located at the void deck of low rise HDB flats which are usually around 3-4 stories high. 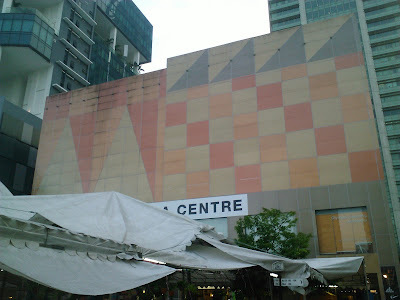 Toa Payoh Town Centre has this unique red-bricked roof so that people walking along the town centre don't have to worry about getting soaked in the rain. Some of the shops at this section of the town centre include spas, hair salons, a coffeeshop, clinics and a very old furniture store. This is a recent addition to the town centre. It's a fitness corner for senior citizens. Senior citizens who want to have a good workout can come here and work out with the fitness stations which are very fun to play with. 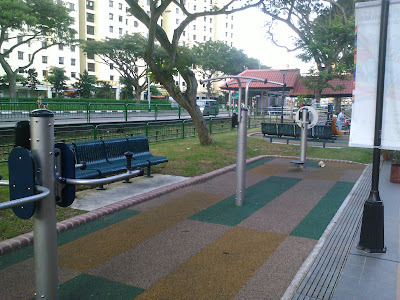 Other than that, there are also benches along the side if they wish to rest after having a good workout here. I wish that it's much more colourful. The fitness corner at my house's void deck has bright yellow poles and handle bars. Maybe the vivid colours can attract more people into coming here and exercise. After turning several times, it's time for me to check out the central part of the Toa Payoh Town Centre. There are two low rise HDB flats that line along the sides of the town centre. In the middle of it, there are plenty of benches for people to sit on and maybe chat with friends and let the time pass by. More shops can be found here at the central part of the town centre. Apart from that, there is also a coffee shop which is seen in the picture that is right above. Toa Payoh Town Centre has a lot of coffeeshops. 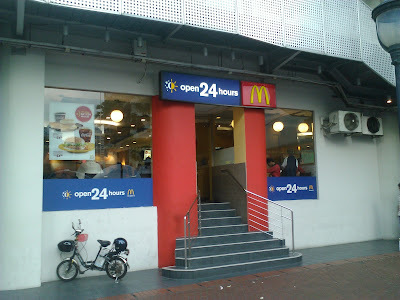 However, the one above was the most memorable for me because back then, it used to be a Malay Muslim-owned coffeeshop. After getting a hair cut at a nearby salon, me and my parents always brought me here to eat some Malay Chicken Rice. Unfortunately, the coffeeshop no longer serves Malay Muslim food now so there is really no reason for me to come and patronise this coffeeshop anymore. Moving on, more shops can be seen when you walk further. Some shops include a beauty and toiletries store. Last time, it used to be filled with lots of people because of its constant sales and deep discounts. Years later, the store is still opened surprisingly but all the crowds were gone. I could see that the store was still going strong so I hope they will not be out of business in the future. Who can't resist cheap toiletries? 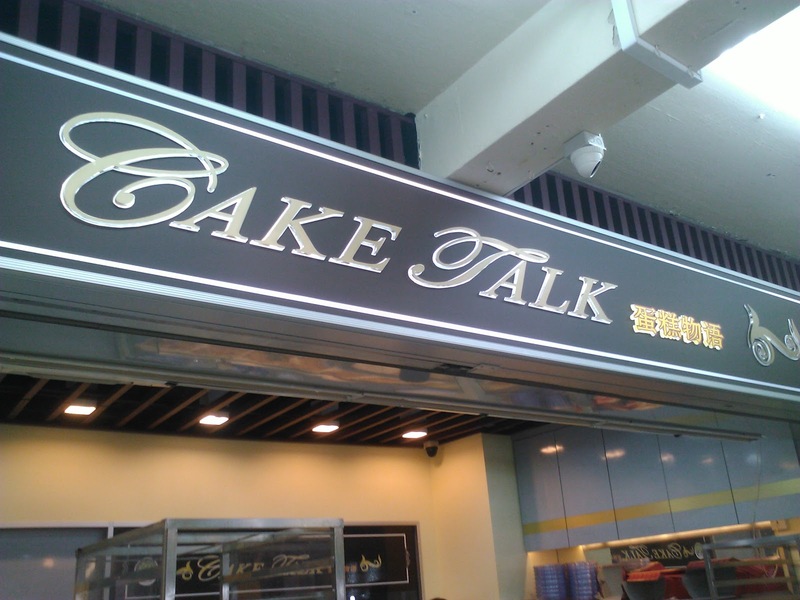 There was also a newly opened Halal bakery known as Cake Talk which I'll talk about it later and several shops selling new and used phones. Some even had phone service repairs and also they sell cases for iPhones and different kinds of phones. There were also some stores that sold clothes and shoes at very cheap prices. After walking out of Toa Payoh Town Centre, there was the Toa Payoh Public Library. Just like the library at Ang Mo Kio, the library here at Toa Payoh is also a standalone building. The National Library Board loved building standalone libraries until they recently start to set up libraries inside shopping malls. Maybe because of cost savings? I have no idea. 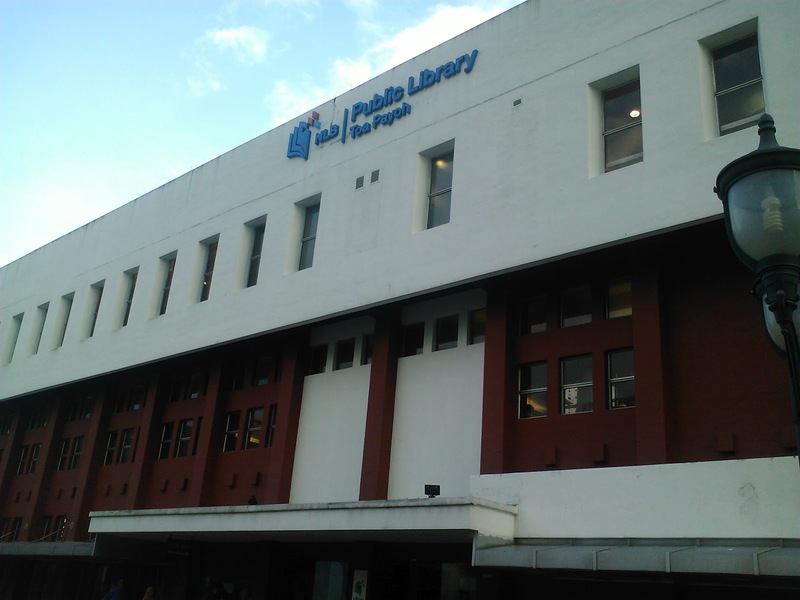 Just like other public libraries, the Toa Payoh Public Library has a wide range of books and materials that are catered to almost everyone. It's been a while since I last visited the Toa Payoh Public Library. I used to come here quite often when I was younger. Thankfully, the library is still alive. Also, way back when I was young, I remembered there was a huge fountain right outside the library and there were seats surrounding the fountain. It's too bad that the fountain has been replaced with a uniquely-shaped open air amphitheatre which I will talk about below. Here's the uniquely-shaped amphitheatre I was talking about. 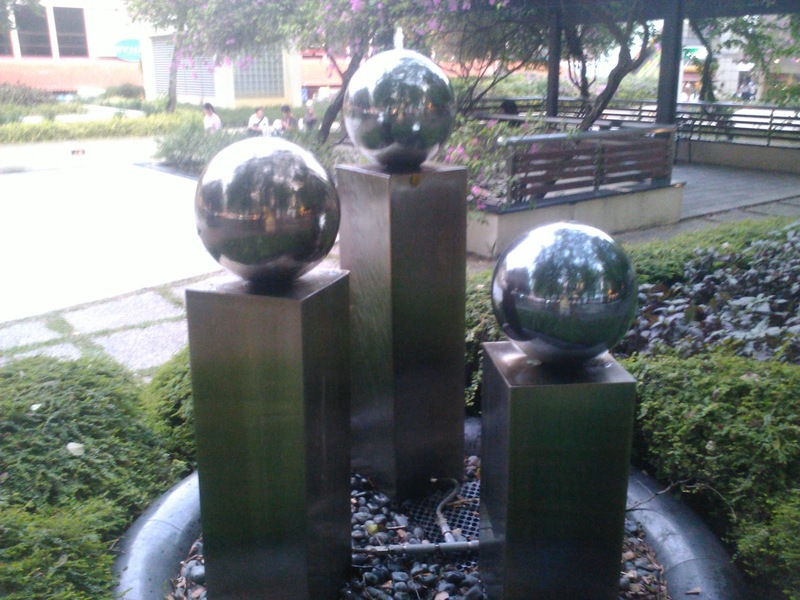 It's supposed to be the replacement for the big fountain that used to be placed outside the library. Nevertheless, the amphitheatre has one of the most unique-looking designs I have ever seen. The roof reminds me of a giant kite. Most probably the amphitheatre is used for events and also shows which the general public can view by sitting on the steps and stone seats near the amphitheatre. I think this was a new addition. Around the amphitheatre outside the library are some unique outdoor seating arrangements. There was this kind of shelter which looks similar to the roof of the amphitheatre. Plus, there were a few seats underneath it and arranged in some sort of cinema-style seating. I have never come across such seats before and they really add to the atmosphere of the open space outside the library. 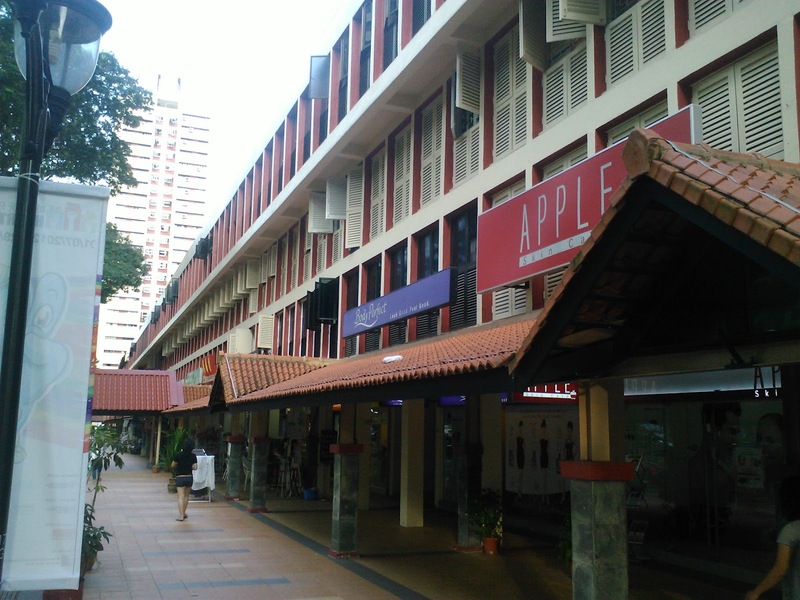 Just adjacent to the Toa Payoh Public Library is a building with shops and restaurants in the building and also on the first level of the building. It's called 600 @ Toa Payoh and contains a McDonald's Restaurant, BBQ Chicken restaurant, a Shop N Save Supermarket and so much more. It's not really considered a shopping centre though. Back then, there used to be an S-11 coffeeshop before the space was given to the current tenants. Also, before the S-11 coffeeshop, a Banquet foodcourt used to exist here too. If you don't know, Banquet is a popular Halal food court chain and operates several outlets around Singapore. 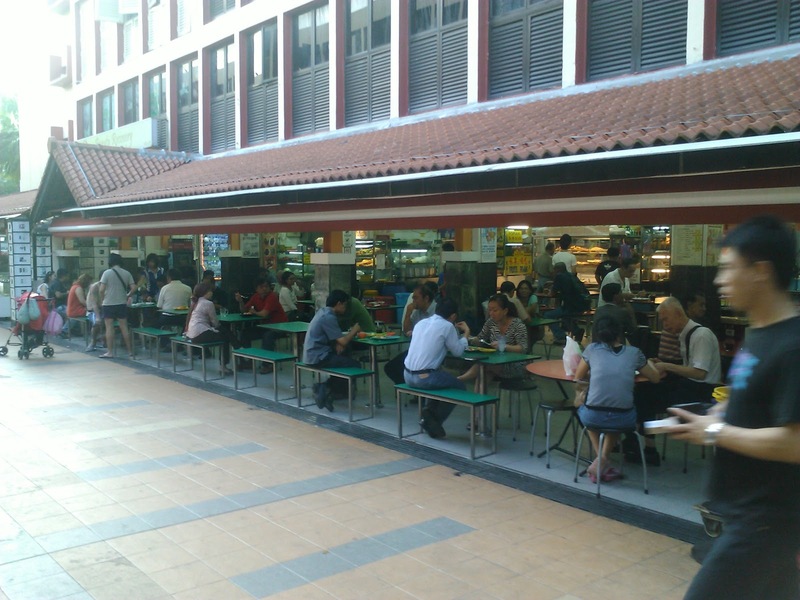 The company that owns Banquet also operates a number of non-Halal food courts like Treats at Parkway Parade. Another thing to note is that a florist has been operating in this building for so long since I was young selling fresh flowers. Never bought anything from them before but if you want to get some fresh flowers for your date or your Valentine, you should come here and get those flowers here. 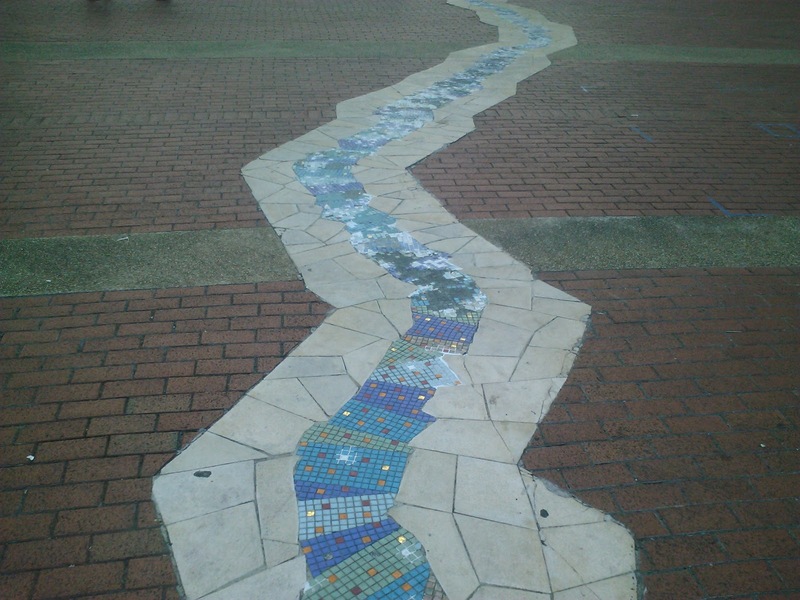 As I was walking back to the town centre from the 600 @ Toa Payoh building and the Toa Payoh Public Library, I saw these unique tiles on the floor. It's sort of like a trail that will lead to the town centre so I am not entirely sure. I didn't fully follow the trail. Still, it's cool and you can see the contrast between the aging red-bricked tiles and the modern blue and peach-coloured tiles. 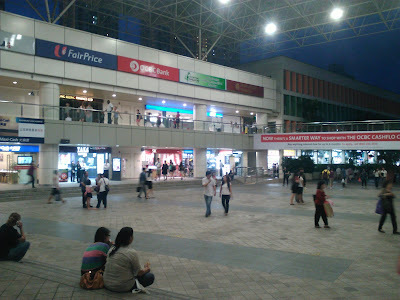 When I visited Toa Payoh Town Centre in the middle of June, there was a night market going on. The proper term to call this night market is Pasar Malam which is Malay for, well, night market. 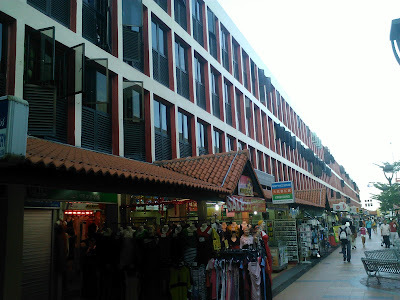 Pasar Malams are great places to find bargains on almost anything from clothes to watches to hardware stuff and more. 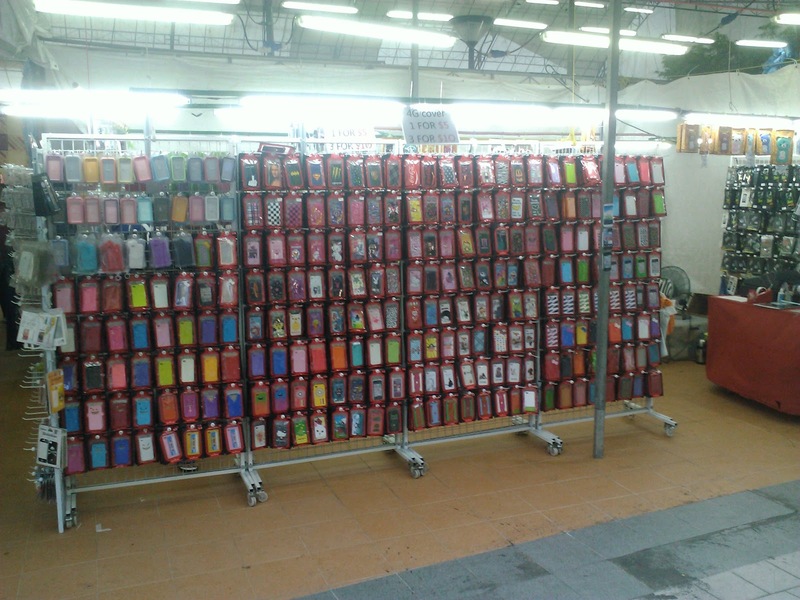 What's common among Pasar Malams is that all of them will have a few stalls selling phone cases of different phone manufacturers. Not only the iPhone but also other phones like Android phones and Windows Phones. It's also quite cheap. I checked the price list and if you were to buy one case, it will cost you $5 whereas if you buy three cases (you can mix and match) it will cost you $10. Isn't that cheap? Another thing common among Pasar Malams are the food stalls. The food stalls in Pasar Malams are very popular. Most of the time these food stalls will sell cheap food like Ramli Burger, Roti John, Chicken Wings, Fishballs and also a wide range of drinks. Don't worry about hygiene though. Each food stall will have a food license and most of them will have sinks. Just like in my previous town centre post about Ang Mo Kio Town Centre, there is also a standalone Courts building here at the heart of Toa Payoh. 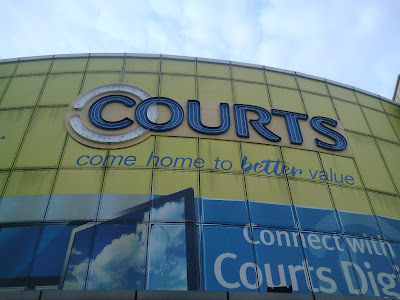 Courts is one of Singapore's biggest furniture and electronics retailer. Over at Courts Toa Payoh, the first level has a wide range of electronics for sale whereas the 2nd and 3rd level concentrate more on furniture and bedding. Courts also organises sales throughout the year so if you're looking for some bargains and savings, look no further than Courts. 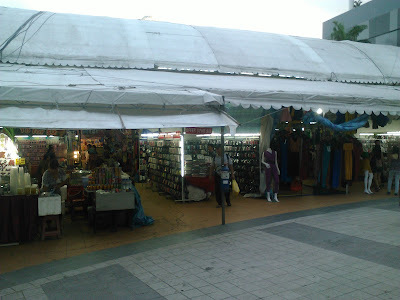 At the basement, there is a Market Hall that sells various items at cheap prices and the reason why they're cheap is that they come straight from the docks. Courts call this 'Hot Off The Docks'. Pretty interesting isn't it? Just right adjacent to the Courts standalone store is the ERA Centre. Sorry about the name partially blocked by the Pasar Malam tent. The ERA Centre is the headquarters of the Singapore property agent company, ERA. It's a shopping mall and has shops at the first and second level of the building. Back then, the ERA Centre was known as Toa Payoh Entertainment Centre which was previously owned by Eng Wah, a cinema operator which operates cinemas in Suntec City and West Mall. This building was also formerly a cinema but it ceased operations a few years ago unfortunately. Now, the cinema halls are used by the staff of ERA. 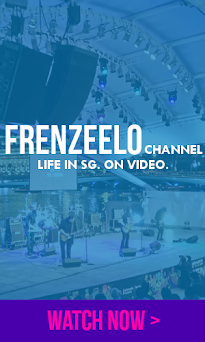 If you enter the building, it looks similar to the nearby Ang Mo Kio Jubilee Square. That's because both were operated by Eng Wah. Jubilee Square isn't a cinema anymore but it's still operated by Eng Wah. Near the ERA Centre and the nearby HDB Hub, the headquarters of the Housing Board, is an interim park with trees and plantations. It used to be a place where children can play in toy cars that they drive themselves (not entirely sure if it's still operating) and there are also plenty of seats within the interim park. I took a photo of two sculptures that caught my attention. 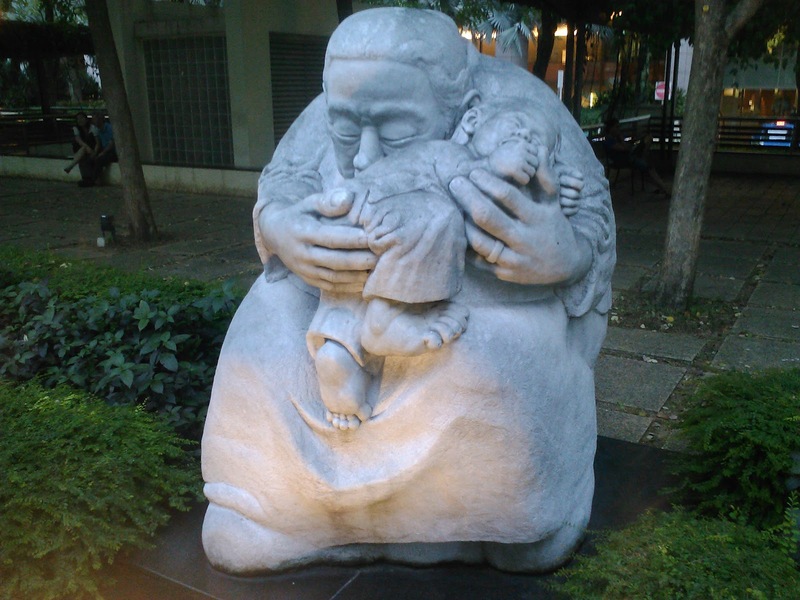 When you come here, you will feel at peace and you will feel that there's some Zen around the interim park. In between ERA Centre and the interim park is a multi-storey building that connects with the standalone Courts building. On the first level is a family restaurant called Crystal Jade whereas the second level is a popular Halal food court known as Fork and Spoon. 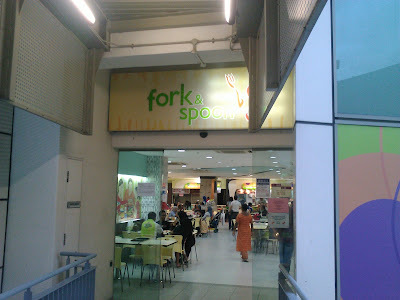 Fork and Spoon serves a variety of different dishes from different cuisines and best of all, it's Halal so our Muslim friends can enjoy different dishes easily. The food court can be accessed by the one-way escalator from the street level or from the lifts that are in the Courts building. Outside the entrance to the food court is a nice view of the Toa Payoh Town Centre and the new and tall Toa Payoh HDB flats. 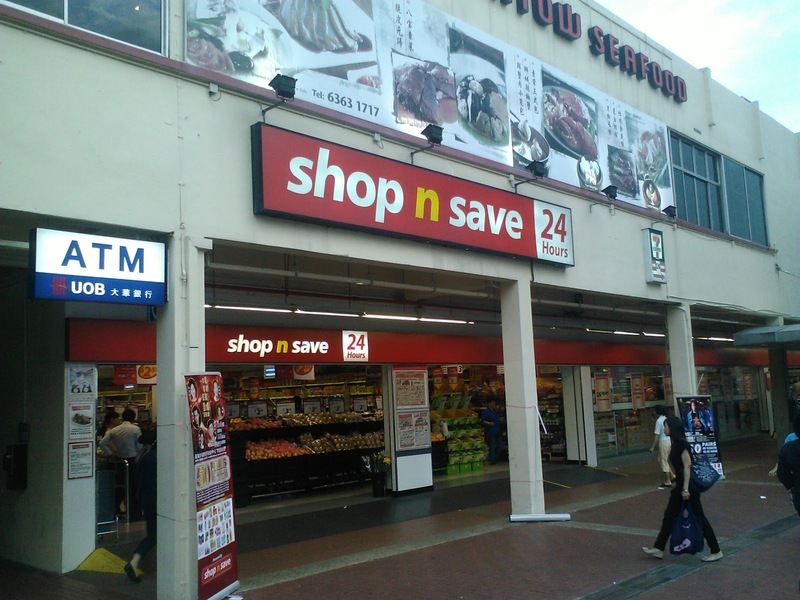 There is also another building nearby which is home to Singapore's first NTUC FairPrice supermarket. NTUC FairPrice is a very popular supermarket which can be found almost everywhere around the island and sells groceries at very low prices. Apart from the first FairPrice supermarket in Singapore, the supermarket at Toa Payoh is also multi-level. That means you can get all your food items at the first level and non-food groceries at the second level. Both levels are connected together with lifts and travellators. There is also a big board talking about the history of NTUC FairPrice and the labour union, NTUC. I was almost going to be on the way back home but before I reached for the bus interchange, there was a new bakery that caught my attention. It's a Halal bakery known as Cake Talk. 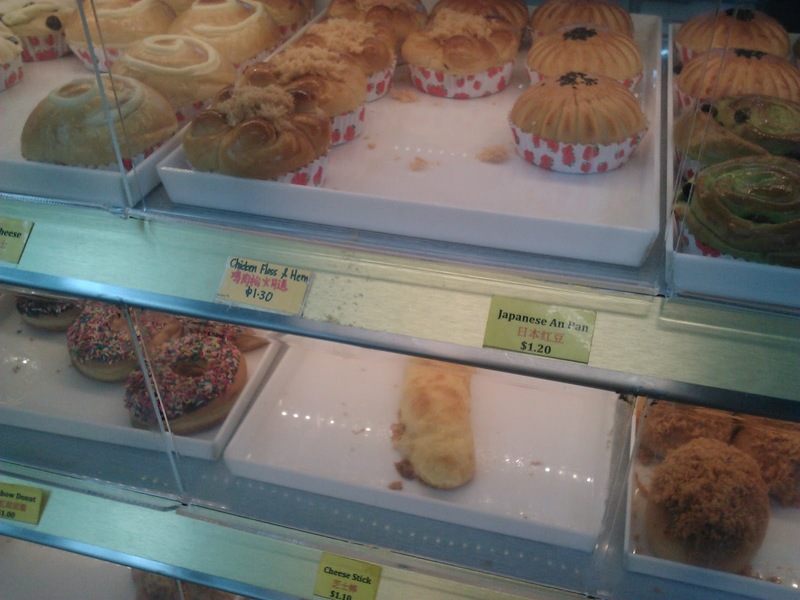 Since it's a bakery, it serves a wide assortment of buns, breads, cakes, desserts and so much more. I got the Coffee Bun, the Chicken Char Siew Bun and the rest I can't really remember that much. I love the Coffee Bun because it reminded me of the wide variety of Coffee Bun bakeries that used to exist in Singapore like Pappa Roti and Rotiboy. If you want to get something light as a snack, do drop by Cake Talk for a great selection of baked goods. However, as of November 2012, Cake Talk has unfortunately closed. 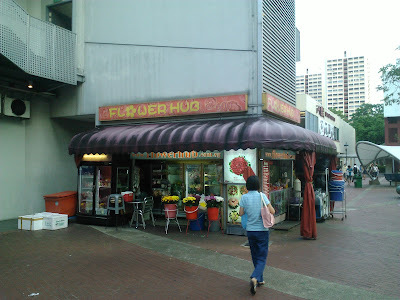 Last but not least, this is the HDB Hub. The HDB Hub is the headquarters of Singapore's Housing and Development Board and it also has a shopping mall which consists of fast food restaurants, banks, bakeries, a post office and it's integrated with the bus interchange and Toa Payoh MRT Station. Speaking of integration, Toa Payoh Bus Interchange is Singapore's first air-conditioned bus interchange if you did not know. This is to provide commuters with a seamless connection among the different types of public transport and commuters get to go shopping for a while. 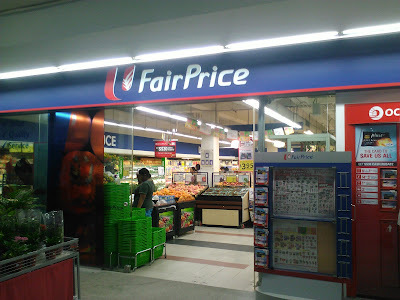 Another thing to note, there is also an NTUC FairPrice here and it's also two levels just like the one in the town centre as mentioned just now. The HDB Hub is also home to the HDB Gallery which I talked about a while back (article here). All in all, Toa Payoh is a great neighbourhood and even though it has a town centre, it has different character than the nearby Ang Mo Kio Town Centre which I talked about a while back. You're lucky if you live in Toa Payoh Town Centre or near it. There are a wide range of shops selling affordable items like clothing, food and electronics accessories just like other town centres. Do drop by the town centre if you have the time. Town centres are much better alternatives than shopping malls plus you get to smell the fresh air as it's an open-air environment.